Each summer, together with the Catholic and Dominican Institute of Mount Saint Mary College and the Notre Dame Center for Ethics and Culture, the Thomistic Institute sponsors a four-day workshop for students and lovers of philosophy. The conference takes place in Newburgh, NY on the campus of Mount Saint Mary College and features renowned presenters from prestigious universities around the world. Co-sponsored by the Catholic and Dominican Institute and the Center for Ethics and Culture. Graduate students, talented undergraduates and all lovers of wisdom are invited to attend. Applications will be accepted beginning January 16th and will close on May 7th, if the workshop is not filled before then. A limited number of scholarships are available for graduate students- if you are interested in applying for a scholarship, please e-mail cdi@msmc.edu prior to registering online. The Catholic intellectual tradition has staunchly maintained that God’s existence can be known by reason alone and long heralded St. Thomas Aquinas’s Five Ways as prime examples of plausible demonstrations. 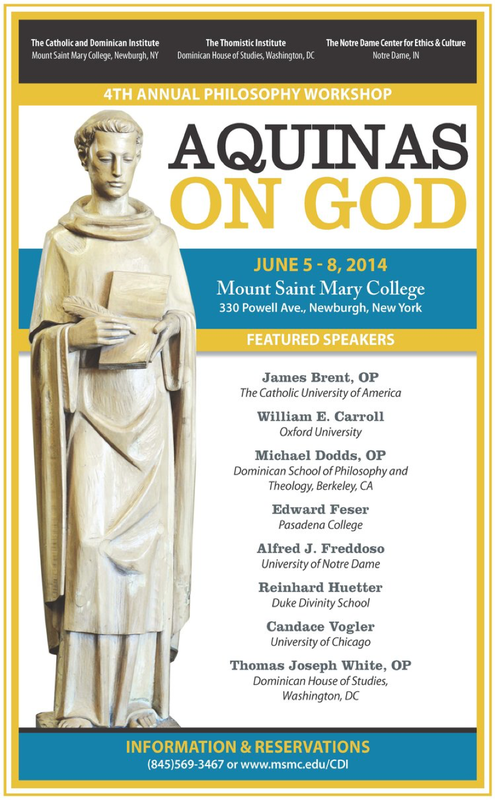 This year’s workshop on the divine attributes will serve as a robust introduction to Aquinas’s natural theology for the Thomistic beginner and a speculative advancement for the veteran. Specific divine attributes will be explored as well as the broader issues of the possibility of knowledge of God in this life and divine naming. In June and July of 2017 we held our 7th Annual Philosophy Workshop. The lineup featured Dr. Edward Feser on "The Distinction of Essence and Existence," Dr. Candace Vogler on "Teleology and Actuation," Dr. Steve Long on "The Primary Being," and more. Take a look at the summer 2017 schedule click here. In June 2016, the gathering of philosophers considered St. Thomas' approach to life in the public square, and how human beings ought to interact with one another within the state. Presentations included "The Common Good" by Steven Long, "Human Rights" by Angela Knobel and "Protecting and Taking Human Life" by Edward Feser. Clock on the link below to hear all of the recorded lectures. The 2015 workshop focused on the building blocks of natural philosophy, from definitions of form and matter, causality and change and prime matter to discussions on the human soul and the hierarchy of forms and modern cosmology. Notable speakers included William Caroll, Michael Dodds, OP and John O'Callaghan. The 4th annual philosophy workshop considered the Thomistic understanding of God, how we can know He exists, His attributes and His action in the world. Selections from the workshop: "Foundations of the Philosophical Knowledge of God in Aquinas" by James Brent, OP, "Divine Goodness" by Candace Vogler and "A Philosophical Notion of Providence" by Alfred J. Freddoso.